Spain’s new Socialist Workers’ Party government has announced it wants to dismantle the razorwire fences which protect the borders of Ceuta and Melilla, the country’s two exclaves on the North African coast, from mass crossings by illegal migrants. “I’m going to do everything possible to see that these razor wire fences at Ceuta and Melilla are removed,” declared interior minister Fernando Grande-Marlaska, in an interview with Spanish radio station Onda Cero reported on Thursday. “It’s one of my main priorities,” the former judge added. Mobs of illegal migrants, sometimes over a thousand strong, launch frequent raids on the two cities, which have been governed by Spain for hundreds of years. They are prized destinations due to the fact they are on European Union soil, and breaking through to them is seen as a shortcut to the welfare states of Western and Northern Europe. Attempts on Ceuta’s border rose by 71 per cent in 2017, with José Luis Gómez Salinero, Colonel of the city’s Civil Guard Command, warning that his men were being forced to contend with “very young and very physically fit” migrants using “hand-made knives” and willing to resort to “unusual violence” to achieve their aim. 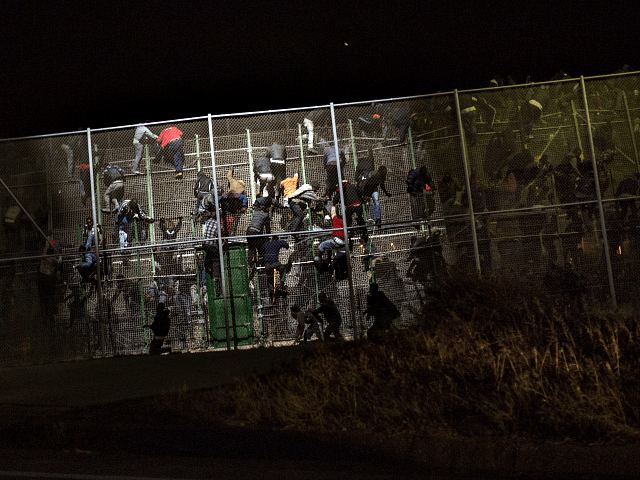 Nearby Melilla faces equally aggressive attacks, with three guards being hospitalised during an assault in May 2017 which saw around a hundred migrants break through. “We can act before [migrants reach the border], at the point of origin, but we cannot let it get to that point,” claimed the interior minister. What the authorities might be able to do in order to prevent a stampede of any migrants who did reach the border — as thousands do, despite the efforts of the Moroccan authorities — remains unclear. The new government seems determined to open Spain up to mass migration, having gone out of its way to invite a transport ship which collected over 600 migrants from people-smugglers a few miles off the coast of Libya to dock in Valencia, hundreds of miles away, after Italy’s new populist interior minister Matteo Salvini turned it away.